It is meant to be used as a layering shirt, so it runs big ( which is great, because I accidentally cut out a size 6! -- good thing I prewashed!). Scout was really excited to be the recipient of my first project since my 9 month sewing hiatus. (Despite her expression in the picture...) She informed me that she is, "classy and classic, so make it classy but not boring." 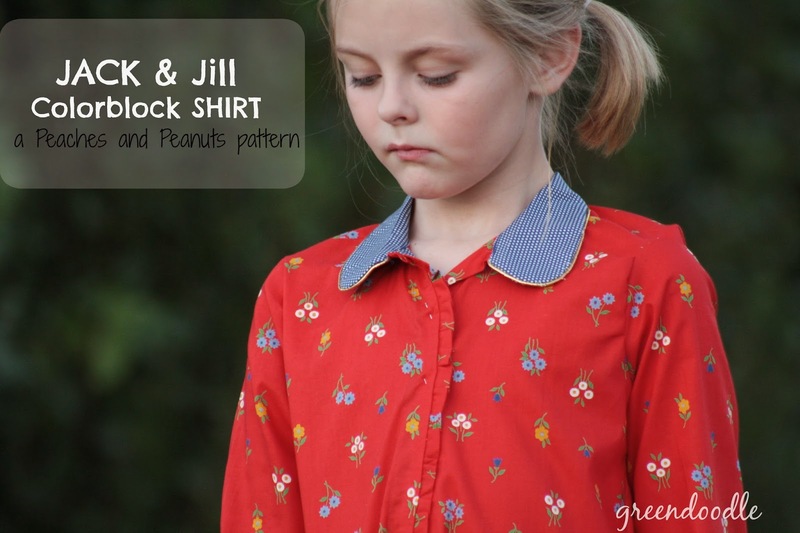 She chose the fabrics, collar and sleeve options, and asked for a little ruffle down the front. The fabric is a treasure I bought at a yard sale a few years ago from a fabric hoarder. True story. Her house was filled from floor to ceiling with yardage of fabrics and trim. I guess it is a good thing I keep moving houses, or I'd be on her hoarding path. The gold trim is also a score from my late Grandma's stash. The pattern is well constructed and easy to follow. I only had minor trouble with the collar and I could use a few collaring tips. Shannon does a nice job of launching personalization ideas with colorblocking on this top as well. You may notice two little pins holding this baby in place. The shirt was a quick sew (which is great because I only had a couple of hours.) I'll insert button holes this afternoon and hope to not muck the whole thing up! I still need to hem it up, and add a little detailing to the sleeve cuffs. It seems this project may have jumpstarted my creativity. I really hope so. It's a junky place to be too busy and too tired to do what feeds your soul. (I'm still too busy and too tired, but I am working at finding a balance). I've already cut a denim skirt with gold trim to work on later this week. I'll be back later this afternoon with more pictures and promo codes to help you get your sewing groove on too! Ooh, Heidi! This is looking really good. I love the fabric choices and the ruffle down the front. I also COMPLETELY understand time crunches. I am honored to be one of your first sewing projects after your 9 month hiatus. Congratulations on your teaching job! So pretty. I love the gold trim! I understand the whirlwind. I too have been MIA from my blog most of the last year. It's hard to get back to, but sewing again makes me so happy :) I hope you are able to keep sewing too! Hi, I am so glad to see you here and glad that you are gaining your footing. I have missed you in this space. I hope you remember me from the Whipstitch Sewing Buddies?? Your finished product is simply adorable.